Jeff Hughes' goal earned League One strugglers Bristol Rovers a draw with 10-man Peterborough United. Jo Kuffour gave the hosts an early lead from inside the six-yard box only for Byron Anthony to head into his own net to draw the visitors level. Posh defender Mark Little was sent off before half-time for a second booking. United took the lead after the break when George Boyd finished well from Craig Mackail-Smith's pass, but Hughes' diving header gave Rovers a point. "The effort and commitment of the players was superb as we were down to 10 men for so long. "With the first tackle Mark Little wins the ball and I wasn't impressed by the reaction of their players and management to the challenge. "If I gave an honest assessment of the officials I would probably get in trouble, so I won't." 90:00+4:11 The referee signals the end of the game. 90:00+2:49 Danny Coles challenges Craig Mackail-Smith unfairly and gives away a free kick. The free kick is swung in left-footed by George Boyd, blocked by James Tunnicliffe. Inswinging corner taken right-footed by Tom Kennedy from the left by-line, Unfair challenge on Conrad Logan by Gabriel Zakuani results in a free kick. Conrad Logan takes the indirect free kick. 90:00+2:49 Booking Danny Coles booked. 88:00 Chris Lines takes a shot. Save made by Joe Lewis. 87:06 Shot by Craig Mackail-Smith from deep inside the penalty area misses to the left of the goal. 85:59 George Boyd produces a right-footed shot from just outside the penalty box that goes wide left of the target. 84:52 Inswinging corner taken by Arron Davies from the left by-line, save made by Conrad Logan. 82:48 Foul by Reggie Lambe on James Wesolowski, free kick awarded. Tom Kennedy produces a strike on goal direct from the free kick. 82:08 Jo Kuffour takes a shot. Save by Joe Lewis. 80:53 Free kick awarded for an unfair challenge on James Tunnicliffe by Craig Mackail-Smith. Danny Senda restarts play with the free kick. 80:27 Effort from outside the penalty box by Reggie Lambe goes wide right of the goal. 78:03 James Tunnicliffe concedes a free kick for a foul on Craig Mackail-Smith. Free kick taken by George Boyd. 77:07 Will Hoskins produces a right-footed shot from inside the area that clears the crossbar. 74:17 Will Hoskins produces a right-footed shot from inside the area that clears the bar. 73:06 Substitution James Wesolowski is brought on as a substitute for Lee Tomlin. 68:20 Lee Tomlin takes a inswinging corner. 64:03 Jo Kuffour fouled by Charlie Lee, the ref awards a free kick. Stuart Campbell crosses the ball in from the free kick, Gabriel Zakuani makes a clearance. 64:03 Booking Booking for Charlie Lee for unsporting behaviour. 61:58 Substitution Chris Whelpdale joins the action as a substitute, replacing Grant Basey. 61:31 Substitution Reggie Lambe is brought on as a substitute for Harry Pell. 60:34 Tom Kennedy sends in a cross, save by Conrad Logan. 59:39 Corner taken by Stuart Campbell from the left by-line, save by Joe Lewis. 56:04 The assist for the goal came from Harry Pell. 56:04 GOAL - Jeff Hughes:Bristol Rovers 2 - 2 Peterborough Jeff Hughes finds the net with a headed goal from close in. Bristol Rovers 2-2 Peterborough. 55:11 The assistant referee signals for offside against Jo Kuffour. Joe Lewis takes the indirect free kick. 54:48 Will Hoskins takes a shot. 54:21 George Boyd challenges Stuart Campbell unfairly and gives away a free kick. Direct free kick taken by Stuart Campbell. 52:52 The assist for the goal came from Craig Mackail-Smith. 52:52 GOAL - George Boyd:Bristol Rovers 1 - 2 Peterborough A goal is scored by George Boyd from deep inside the penalty box to the bottom right corner of the goal. Bristol Rovers 1-2 Peterborough. 51:25 Chris Lines takes a shot. Blocked by Grant Basey. Inswinging corner taken right-footed by Stuart Campbell from the left by-line, James Tunnicliffe takes a shot. Save by Joe Lewis. 49:51 Free kick awarded for a foul by Arron Davies on Chris Lines. Chris Lines delivers the ball from the free kick right-footed from right wing, clearance by Gabriel Zakuani. 47:11 Danny Coles concedes a free kick for a foul on Craig Mackail-Smith. The ball is crossed by Lee Tomlin, Header by Charlie Lee from deep inside the penalty area misses to the left of the target. 45:46 Chris Lines challenges Charlie Lee unfairly and gives away a free kick. Charlie Lee takes the free kick. 45:00+5:04 The match has reached half-time. 45:00+3:56 Stuart Campbell fouled by Mark Little, the ref awards a free kick. Free kick taken by Conrad Logan. 45:00+3:56 Sent off Mark Little shown a red card. 45:00+3:25 Foul by Chris Lines on George Boyd, free kick awarded. George Boyd takes the free kick. 45:00+2:01 Will Hoskins takes a shot. Blocked by Gabriel Zakuani. Stuart Campbell takes the inswinging corner, George Boyd manages to make a clearance. 45:00+0:30 Jeff Hughes fouled by Mark Little, the ref awards a free kick. Byron Anthony restarts play with the free kick. 45:00+0:30 Booking Mark Little is shown a yellow card for unsporting behaviour. 44:04 Shot from just outside the box by Harry Pell goes over the target. 42:35 George Boyd concedes a free kick for a foul on Stuart Campbell. Free kick crossed by Chris Lines, Tom Kennedy manages to make a clearance. 42:02 Close range headed effort by Charlie Lee goes wide of the left-hand post. 41:44 Short corner taken by George Boyd. 39:39 Stuart Campbell takes the inswinging corner, clearance by Mark Little. 38:47 A cross is delivered by Lee Tomlin, Byron Anthony makes a clearance. Corner taken right-footed by Lee Tomlin, Charlie Lee takes a shot. Save by Conrad Logan. 36:19 Stuart Campbell fouled by Lee Tomlin, the ref awards a free kick. The ball is crossed by Will Hoskins, Danny Coles has a headed effort at goal from close in which goes wide right of the target. 33:10 The ball is swung over by George Boyd, blocked by Byron Anthony. Inswinging corner taken by George Boyd from the right by-line, Byron Anthony makes a comfortable save. 31:38 Right-footed shot by George Boyd went wide left of the goal. 31:04 Unfair challenge on Lee Tomlin by Jeff Hughes results in a free kick. Free kick taken by Lee Tomlin. 27:11 Free kick awarded for a foul by Chris Lines on Tommy Rowe. Lee Tomlin has a direct shot on goal from the free kick, Conrad Logan makes a save. 25:41 Booking The referee cautions Joe Lewis for dissent. 24:01 Free kick awarded for an unfair challenge on Gabriel Zakuani by Jo Kuffour. Indirect free kick taken by Joe Lewis. 22:40 The assist for the goal came from George Boyd. 22:40 GOAL - Byron Anthony:Bristol Rovers 1 - 1 Peterborough Own goal by Byron Anthony. Bristol Rovers 1-1 Peterborough. 22:00 Byron Anthony challenges Craig Mackail-Smith unfairly and gives away a free kick. George Boyd crosses the ball in from the free kick. 19:54 Jo Kuffour is caught offside. Joe Lewis restarts play with the free kick. 19:25 Stuart Campbell takes a shot. Joe Lewis makes a save. 17:42 Booking Harry Pell goes into the book. 15:33 A cross is delivered by George Boyd, Headed effort from inside the penalty area by Craig Mackail-Smith misses to the right of the target. 13:33 Centre by Arron Davies. 10:37 The offside flag is raised against Craig Mackail-Smith. Conrad Logan takes the indirect free kick. 9:49 Byron Anthony fouled by Lee Tomlin, the ref awards a free kick. Danny Senda crosses the ball in from the free kick. 5:02 Assist on the goal came from Byron Anthony. 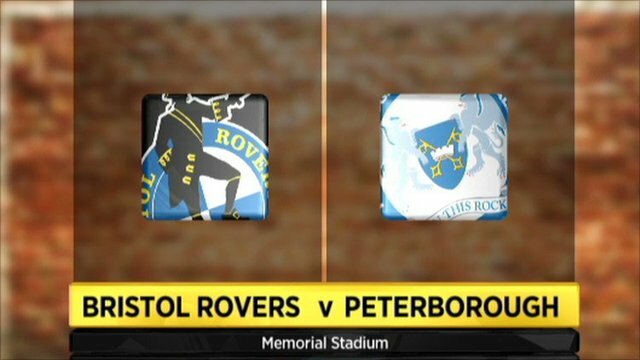 5:02 GOAL - Jo Kuffour:Bristol Rovers 1 - 0 Peterborough Goal scored by Jo Kuffour from inside the six-yard box low into the middle of the goal. Bristol Rovers 1-0 Peterborough. 2:33 The ball is crossed by Harry Pell, Will Hoskins takes a shot. Clearance by Grant Basey.